Sharpen your writing skills. Develop critical thinking skills. Read and discuss some of the best literature ever written. Study – and conduct research with – some of the country’s top faculty. Get ready to take on the world. Do you embrace challenges? Consider the English Honors program for advanced study opportunities. Honors students sign on for small seminar classes, independent study with faculty mentors, and sustained research projects. The department offers a B.A. in English. Choose from a variety of concentrations to pursue your passions: focus on creative writing; film; literature; language, writing and rhetoric; or earn your credentials to become a teacher. 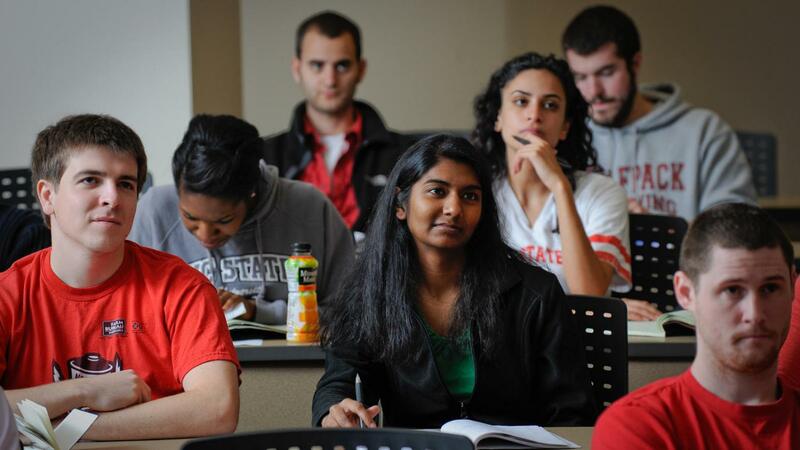 At NC State, you don’t have to limit your education to the classroom. Test your wings and study abroad. Try out some career paths through internships. Contribute to the discipline by conducting research. Alexandra is a senior Anthropology and English double major with a minor in French. Read about her experiences abroad, her leadership roles on campus, and her work in publishing. Choose from eight English minors to enhance your undergraduate experience, gain valuable skill sets in writing, editing and communication that are highly valued in any profession. Master the fundamentals of writing and editing while you sharpen your publication skills and your knowledge of the profession. Through this five-course program, we’ll help you get ready to enter the fields of journalism, public relations, information services and technical writing. "Now, the down side is that it’s always piece work. You get up and you face the same blank page every day. The up side is that you face the same blank page every day. And every day is a chance at redemption. Every day is a chance to do it better. Every day is a chance to make yourself laugh as you write. It’s a wonderful way to make a living. And the overhead is so low." In addition to supporting all the students who choose NC State for our outstanding English program, our department also touches nearly all students at the university . Most NC State students take one or two writing courses in their freshman year, depending on their placement scores, to satisfy the general education requirements in writing and speaking. Juniors and seniors majoring in a variety of technical, scientific, and management-oriented fields choose among several professional writing courses. Students who want real world experiences that test their writing, editing and communication skills come to our department’s internship program. We’ll make sure you find expert supervision in professional settings. Find engaging courses and programs and learn from experience. Undergraduate research opportunities, service and community-based learning, collaborative projects, and learning communities await you here at NC State! Ask and ye may receive. We award scholarships to English majors, including the A.M. Fountain Scholarship, the Eugene H. Harrison Scholarship, the Guy Owen Memorial Scholarship, and the Department of English Interns' Scholarship. The NC State Chapter of Sigma Tau Delta – Alpha Pi Theta – recognizes high scholastic achievement and offers opportunities for leadership and service. Faculty from across the College of Humanities and Social Sciences lead a wide-ranging variety of study abroad adventures and and field schools that span the globe. You might even qualify for scholarship support.